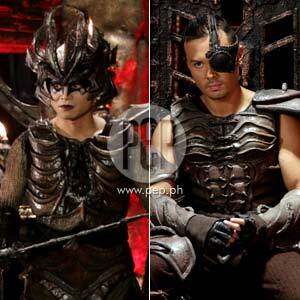 Can the Panday Kids defeat the forces of evil led by Lizardo (Marvin Agustin) and Cicero (Polo Ravales)? Find out in the final week of Panday Kids on GMA-7. After a series of conflicts and battles, GMA-7’s new generation of superheroes Panday Kids gather all their strengths and forces to put an end to Lizardo’s evil reign in the human race with its explosive finale week from May 31 to June 4. Since it started last February 22, the Panday Kids have been constantly struggling to protect the legendary sword and to save the world from all its catastrophes and misfortunes, brought upon by the evil powers of Lizardo. Now that their journey is coming to an end, Panday Kids Oliver (Buboy Villar), Hadji (Julian Trono) and Charlie (Sabrina Man) will face their most dreadful challenges and appalling confrontations ever. As their loved ones fall into the wicked hands of Lizardo, the Panday Kids are seemingly losing the vigor and courage to battle. As a result, Lizardo is becoming stronger and more frightful which threatens their endurance and survival. Will Lizardo be successful in defeating the Panday Kids? How will our heroes handle all of Lizardo’s ominous plans when their family is in immense danger? Will the zealousness of fighting find its way back to their hearts? Are the ability and wisdom they gathered all throughout their fights enough to bring down the invincible Lizardo? And finally, what will happen after the ultimate combat? Witness more adventures, heart-stopping fight scenes and revealing confrontations as the new breed of warriors fight the forces of evil on the final week of Panday Kids. Watch them from May 31 to June 4 after 24 Oras on GMA Telebabad.